The team behind the Arenacross Tour has once again broken new ground with the introduction of a new Pro-Am class which will run at the remaining four rounds of Arenacross at Birmingham (1st and 2nd February) and Sheffield (16th and 17th February). 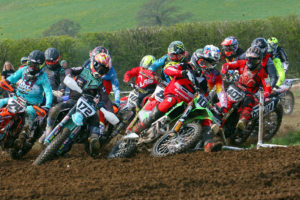 The class is open to riders aged 16 and over, riding a 125cc/250cc 2-stroke, or 250cc/450cc 4-stroke machine. Only 12 riders will be accepted per round, each of whom will get plenty of riding time with practice, qualifying and race one during the day and a Main Event racescheduled as part of the evening programme in front of, what is anticipated, to be a packed and enthusiastic audience of screaming AX fans. The idea behind the new class is to offer an opportunity for riders, teetering on the edge of both amateur and pro circles, to have a shot at Arenacross but, without the intimidation of having to mix it with the hard-charging, hugely-experienced AX pros. It’s aimed at the guys (and girls) who want to ride Arenacross, but who previously thought it was unattainable. Commenting on the new AX segment, ASL’s Matt Bates said; “The All-Ireland amateur class that we staged in Belfast last week was a massive success. It gave local riders the chance to compete in an event like Arenacross without the daunting thought of lining up against the likes of full-time indoor specialists such as Cedric Soubeyras. That’s why I’ve made the decision to extend the offer with a national cup class for riders that just sit below the Pro ranks but still want to give AX a go. Interested riders should call the MCF office on 08454 750057 or email Gaynor@mcfederation.com to secure their place. The Woodcock Returns. Dylan’s AMA reflections and racing Arenacross this weekend! CC- GP 2019 is here ….. Steve Ireland and David Knight join forces!